Leave it to the Redtick Coonhound to stick his nose where it does not belong! Yes, my dog Valentino has had his first injury while in my care. 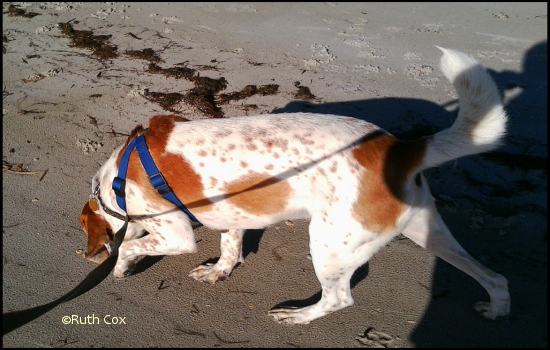 It happened on one of our daily walks on the dog friendly beach here in Lanark Village, Florida. While walking and running the shoreline I allow Valentino the lead on his fourteen foot leash. He loves to follow his nose and one never knows where, or to what, it might lead us. On this particular day I was cell phone camera ready to capture the dog's nose "bitten" when he stuck it too close to that which attracted him with its scent. 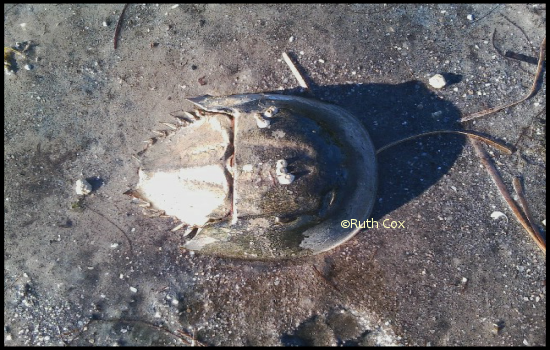 Valentino yelped and dashed away for a moment, just long enough for me to snap a shot of the sea creature belly up in the mucky sand of low tide—a horseshoe crab! Noticing the crab was missing its tail, I gently turned it over, all the while wondering if it would survive its life in the ocean without a tail. 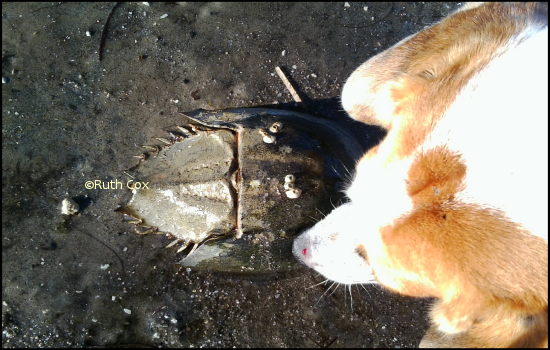 The tail is harmless and mostly used by the horseshoe crab to right itself and when swimming it acts as a guide for the crab, perhaps leading its way much like my dog's nose! Naturally, my dog Valentino had to return to check out the creature that bit him. Click the picture for a larger view and you can see a red spot of blood on his nose. Even though my dog's bite seemed minor, I cut our beach walk short that day, heading home to clean the piercing. I then dabbed a bit of peroxide and topical antibiotic ointment on it. 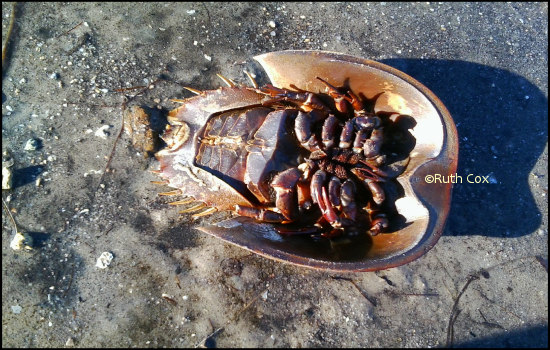 I'm sure all the doctoring stung more than the horseshoe crab injury did! But of course, Valentino received a KONG dog toy stuffed with a special treat to ease his hound dog nose! 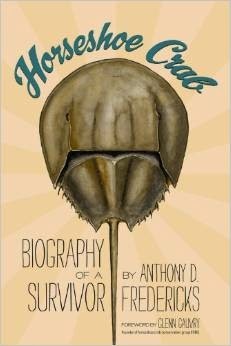 For your reading pleasure and to increase your knowledge here are a couple of great books about the horseshoe crabs. Has your dog ever been bitten by sticking his nose where it doesn't belong? 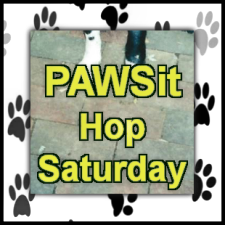 Pause for a few moments to tell your dog story tale in a blog post and link up with PAWSit Hop Saturday here at Dog Pawsitive Tidbits this week. 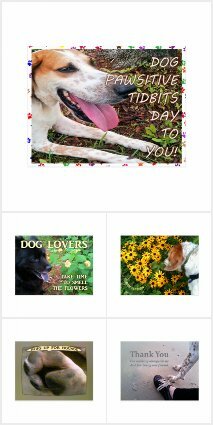 Please grab our graphic for your post and link it to this page so other dog lovers may join with their own dog paw prints.